Commerical Lighting Control with wireless simplfies wiring in multiple locations within a commercial building. A building owner decided to add switch locations when electrical work in a building had already been halfway completed. The new electrical plan called for luminaries in the building to be controlled from multiple locations had initially installed a single switch for each fixture. Pulling wires to the new switch locations was impractical. The completion date of the project was in jeopardy of slipping. The architect and contractor used ILLUMRA self-powered wireless light switches occupancy sensors and ILLUMRA wired-in controllers to simplify wiring. Wireless switches installed at the desired new locations eliminated the need to run switch leg or traveler wires. Wiring was simplfied. Because the switches never need batteries, they will never require maintenance. 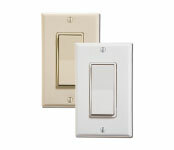 Wireless relay controllers were installed to receive radio signals from the new ILLUMRA wireless light switches, occupancy sensors and control the luminaries. The project was successfully finished on-time.